The Indian Hotels Company Ltd is a subsidiary of Tata Sons Ltd. It is mostly promoter driven with promoters contributing the largest part of the shareholding. The detailed shareholding pattern is as given below. Mr. Raymond Bickson is the Managing Director & CEO of the company. Mr Bickson brings in international hotel experience and was voted as one of the Top 10 Best Hotel Managers by Leaders Magazine from 1997-2002. IHCL follows a broad based differentiation strategy. They have a differentiation strategy targeting the premium segment. But they have also expanded their offerings internationally to target a broader segment. The key operating characteristics of luxury hotel industry are occupancy percentage and average revenue per room. As the hotel industry have their peak demand during the second half of a year, it is prudent for IHCL to take necessary steps to improve the occupancy rate in the first half. Their occupancy rate of 67% is way better than the industry average of 60% but their competitor Leela Ventures is closing in by maintaining a better occupancy rate. Also, IHCL desperately needs to improve its� operational efficiency. IHCL�s Operating Expenses Margin of 83% compared to Leela�s 66% portrays this bad picture. As it can be seen from the table below, the consolidated Profit after Tax stood at (68.87) crores at the end of 2011 registering a marginal increase of 49.53 crores. The increase in revenue was mainly on account of additional room capacity being added, higher occupancy, average room rates and revenue per available room (RevPar). Decrease in debt proportion did also contribute towards the improvement of contribution margin. Room sales showed a healthy growth over the previous year as a result of higher room rates and occupancies. Food & Beverages grew by 19% over the previous year. The VRIN framework has been used to have a resource based view of the firm and identify the key sources of IHCL�s competitive advantage. The analysis of various resources of IHCL has been done and the following five resources have been found to be vital in determining the competitive advantage of IHCL over other players in the market. These resources are being further analysed by applying the VRIN framework. Thus �site and location� and �Brand strength� are two most critical resources available with IHCL. Tetra threat framework has been deployed to diagnose the sustainability of superior performance of Taj hotels within the Indian Luxury Hotels space. The resources considered are those identified through the VRIN analysis. Further, Site – a key resource can�t be imitated by its sheer nature. The threat of imitation can be thus concluded as being Moderate. The major substitutes that challenge the value-addition done by the key resources are Service Apartments and Company owned guesthouses. Service apartments are flourishing currently due to rising needs of corporate and shortage of hotel rooms in most cities. They result in saving of 25-40% as compared to the prevailing hotel prices and thus an economical option. Taj operates some upmarket service apartments in Mumbai and as a result has a straddled response to this threat. The threat of substitution can be thus termed as Low to moderate. The size of Taj�s vendors is relatively small and consequently they have low bargaining power. The buying power of luxury hotel patrons is very high because of largely undifferentiated products and very low switching costs However, Taj has been able to demonstrate over-average customer loyalty, thus, the threat of holdup is not credible in the near future. Industrial relations for the company have been cordial and no credible threat is envisaged on this front due to past records and motivated employees. The employee motivation levels can be adjudged from the employee sacrifices during 26/11 attacks. The overall threat of slack can be thus marked low. Due to absence of clear flow of activities, an alternate value-chain for the hotel industry is drawn below. The Guest Feedback Management system in IHCL helps develop new products and services. It also measures guest perception of the Brands through inclusion of Brand specific parameters. IHCL continuously renovates their hotels and introduces various state of the art facilities such as Jiva Spa, Wildlife Lodges, etc. “Service-Providing” refers to the value addition from the core operations of the hotel. Direct Enquiries and In-house reservation system are the most profitable channels of marketing due to the absence of third party commissions. The strategic fit of the organization and its readiness for the future was tested using the McKinsey 7S framework. The current and past strategies propose a great fit with the other six elements explaining the reasons for IHCL�s balanced growth. Strategy: IHCL expanded its horizon by broadening its international market reach and entering into management contracts in Mexico and British Virgin Islands for development of high end Luxury Resorts. IHCL also acquired New York based luxury hotel “The Pierre” in 2005 as part of its international expansion plan. Structure: The major stakeholders in IHCL are promoters (Tata Sons Ltd.) and financial institutions/banks. Accordingly, the major driving force in decision making is Mr. Ratan Tata, chairman of IHCL�s board of directors. Staff: The recruitment process at IHCL is completely undertaken by the HR department. HR initiatives during the last year were focused on further enhancing the engagement within the workforce, sustaining workforce cost & productivity and enabling a responsive system to the business challenges through optimized use of technology platforms. Shared Values: Business excellence has been embedded in Tata through processes and methodologies that enable Tata companies to continually improve operations and achieve the world-class marquee. Style: IHCL believes Corporate Governance is a continuous journey to provide a congenial environment to harmonise the goals of maximizing the stakeholders' value and maintaining a customer-centric focus. The internal audit process, through its unique �Taj Positive Assurance Model�, which is an objective methodology of providing a positive assurance based on the audits of operating units and corporate functions, is a convergence of Process Framework, Risk and Control Matrix and a Scoring Matrix. Skill: HLVL has excellent branding, positioning, communication and hospitality skills. Their re-launch Surprise Campaign is appreciated by Guests. Taj Forever Campaign has been adjudged the best marketing programme in the world and awarded many PATA awards. System: The Company established the Taj Public Service Welfare Trust (The Trust) in response to the terror attack on the city of Mumbai in 2008. Also, IHCL continues to voluntarily participate in the globally recognised Carbon Disclosure Project to demonstrate its commitment towards performance in climate change mitigation. 1) The IHCL was the only firm in the Luxury hotel industry to add close to 1500 rooms across all segments. This increase in capacity reflects the confidence and health of the firm especially in the face of the grim exogenous factors which will be discussed later. 2 IHCL has been successful in increasing its top line from Rs. 2,562.53 million in 2010 to Rs. 2,914.90 million in 2011. 3) The Luxury hotel industry is a capital intensive industry. Hence IHCL�s debt to equity ratio of 1.66, down from 1.89 is good, showing stable growth and a promising future. 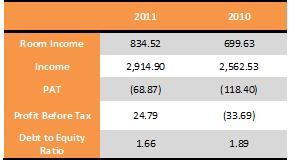 4) The firm has an excellent dividend paying record of 100% for the last four fiscal. IHCL is one of the highest dividends paying company in the hotel industry. The Indian Tourism & Hotel industry was badly hit during the 2008-2009 global recession. It impacted the Indian tourism sector drastically, resulting in a decline in the number of foreign tourists, a major source of customers for the Luxury hotel segment in particular. With Indian hotels classified into six categories according to the star rating assigned by the Department of Tourism, about 30% of the rooms fall under the Five Star deluxe categories. In addition many international investors have planned to make large scale investments in the hotel industry, which would add 65,000 additional rooms in various hotels in India. Another occurrence whose impact is still being felt is the letdown of the Commonwealth games. Seven hotels were added by Taj in anticipation of the commonwealth games as well as tariff rates were hiked marginally. But when the time came the inflow of tourists was extremely disappointing leaving Taj with excess unutilized capacity. 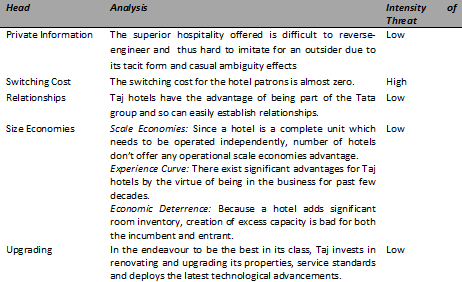 Though these factors were exogenous to IHCL and affected the luxury hotel industry at large in India, Its effects were felt comparatively more by IHCL due to its unique positioning and existence. According to the Indian Tourism Industry Analysis report – India�s tourism and hospitality sector market shows the most potential in the world. The Indian hospitality sector is expected to grow at the rate of 8% between 2007 and 2017. India saw an influx of 10 million international tourists by 2010, up from just 4.98 million in 2007.With the potential and future growth of this industry we recommend the following for IHCL. As a result of the increase in capacity after the commonwealth games IHCL should tap into the increasing tourists and increase its occupancy %.Its premium image of IHCL as well as its presence abroad should be leveraged. As was seen from table 6 in the industry analysis report the occupancy rate for almost all types of luxury hotels are in the range of 60% making them idle for half the time which is common in the hospitality sector. But their growth rate is expected to be at least 40% as shown in the graph below for the next five years. In keeping with this we would also recommend that Taj expands its hotels, given its good financial health combined with the robust and growing tourism industry. This expansion should be centred on upcoming tourist spots as well as commercial hotspots like Gurgaon. Reduce Operating expenses by borrowing other firms more efficient strategies. The operating expense margin of IHCL is much higher when compared with its competing firms. In particular, Leela�s is 66.48 whereas IHCL is 83.18. IHCL should analyse its� competitors practises in an attempt to reduce its� overall operating expense margin. In particular IHCL should speed up the implementation of the use of the Balance score card, as done by The Leela which records its performance along the parameters of financial growth, guest satisfaction, strong internal processes, employee satisfaction and training. The operational efficiency of the company is driven by the implementation of the Balance Score Card. M. Ravi Kumar (PGP 2011-13) holds a B.E from JNTU College of engineering, Hyderabad. He can be reached at ravi.kumar@iimb.ernet.in. G. Amith Kumar Reddy (PGP 2011-13) holds a B.E from ITBHU, Varanasi. He can be reached at amith.reddy@iimb.ernet.in. Raja Simon J (PGP 2011-13) is a Chartered Accountant. He can be reached at raja.simon@iimb.ernet.in. Dhanashree Shirodhkar V (PGP 2011-13) holds a B.E from VJTI, Mumbai. She can be reached at dhanashree.shirodhkar@iimb.ernet.in. Sumedha Goenka (PGP 2011-13) holds BA (Hons) from St Stephen�s College. She can be reached at sumedha.goenka@iimb.ernet.in. The student contributors would like to thank Prof. S. Chandrasekhar,Professor in the Corporate Strategy & Policy Department of Indian Institute of Management, Bangalore, for his guidance in their work. He can be reached at schandra@iimb.ernet.in.